Christiansen, Dorte M. 2017. Posttraumatic stress disorder in parents following infant death: A systematic review. Clinical Psychology Review, Vol. 51, Issue. , p. 60. Moore, Donna and Ayers, Susan 2017. Virtual voices: social support and stigma in postnatal mental illness Internet forums. Psychology, Health & Medicine, Vol. 22, Issue. 5, p. 546. Ford, Elizabeth Lee, Suzanne Shakespeare, Judy and Ayers, Susan 2017. Diagnosis and management of perinatal depression and anxiety in general practice: a meta-synthesis of qualitative studies. British Journal of General Practice, Vol. 67, Issue. 661, p. e538. 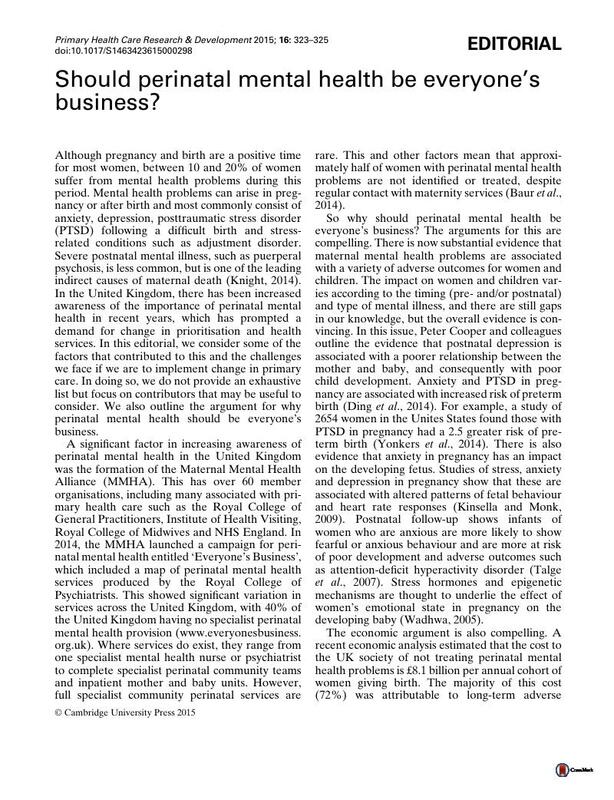 Should perinatal mental health be everyone’s business? All-Party Parliamentary Group (APPG) for Conception to Age 2. 2015: Building Great Britons. Retrieved from http://www.1001criticaldays.co.uk/buildinggreatbritonsreport.pdf. Bauer, A., Parsonage, M., Knapp, M., Iemmi, V. and Adelaja, B. 2014: Costs of perinatal mental health problems. London: Centre for Mental Health. Ding, X.X., Wu, Y.L., Xu, S.J., Zhu, R.P., Jia, X.M., Zhang, S.F., Huang, K., Zhu, P., Hao, J.H. and Tao, F.B. 2014: Maternal anxiety during pregnancy and adverse birth outcomes: a systematic review and meta-analysis of prospective cohort studies. Journal of Affective Disorders 159, 103–110. Fontein-Kuipers, Y.J., Nieuwenhuijze, M.J., Ausems, M., Bude, L. and de Vries, R. 2014: Antenatal interventions to reduce maternal distress: a systematic review and meta-analysis of randomised trials. British Journal of Obstetrics and Gynaecology 121, 389–397. Glover, V. 2014: Maternal depression, anxiety and stress during pregnancy and child outcome; what needs to be done. Best Practice and Research Clinical Obstetrics and Gynaecology 28, 25–35. Khan, L. 2015. Falling through the gaps: perinatal mental health and general practice. London: Royal College of General Practitioners and Centre for Mental Health. Kinsella, M.T. and Monk, C. 2009: Impact of maternal stress, depression and anxiety on fetal neurobehavioral development. Clinical Obstetrics and Gynecology 52, 425–440. Knight, M., Kenyon, S., Brocklehurst, P., Neilson, J., Shakespeare, J. and Kurinczuk, J.J. (editors), on behalf of MBRRACE-UK. 2014: Saving lives, improving mothers’ care – lessons learned to inform future maternity care from the UK and Ireland confidential enquiries into maternal deaths and morbidity 2009–12. Oxford: National Perinatal Epidemiology Unit, University of Oxford. Royal College of Psychiatrists. 2001. Perinatal mental health services. Recommendations for provision of services for childbearing women, CR88. London: Royal College of Psychiatrists. Talge, N.M., Neal, C. and Glover, V. 2007: Antenatal maternal stress and long-term effects on child neurodevelopment: how and why? Journal of Child Psychology and Psychiatry 48, 245–261. Wadhwa, P.D. 2005: Psychoneuroendocrine processes in human pregnancy influence fetal development and health. Psychoneuroendocrinology 30, 724–743. Yonkers, K.A., Smith, M.V., Forray, A., Epperson, C.N., Costello, D., Lin, H. and Belanger, K. 2014: Pregnant women with posttraumatic stress disorder and risk of preterm birth. JAMA Psychiatry 71, 897–904.